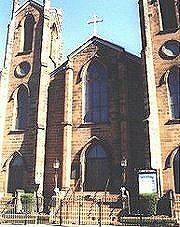 St. John's church was the first Roman Catholic Church to be built in Newark. Its origin provides an interesting story. At the time (1820) Catholics were not welcome in the area. The building of the Morris canal, along with the newly opening factories, brought many Irish workers to Newark. After holding services in private homes they decided, in 1826, to build a church. The following homes held these meetings: Charles Durning, Martin Rowan, Christopher O'Rourke, John Shelock, Jean Vache and Anseim Fromeget. A lot at 14 Mulberry Street was purchased. The foundation was laid and the church funds ran out. At this time the First Episcopal (Trinity) church allowed the builders to use their church for a lecture by a Catholic clergyman from St. Peter's Church in New York City. This "fundraiser" put $300.00 in the coffers of the builders. Unfortunately the building treasurer ran off with the money, putting the parish back in the red. This turn of events made the church members willing to underwrite the building costs. The church was finished in 1828 but the building debt almost forced the sale of the church. At the last minute the Propagation of the Faith in France contributed 22,960 francs to pay the debt. By 1848, under the guidance of Father Patrick Moran, the church was enlarged three times. In 1842, Father Moran had the entire congregation take a pledge of abstinence from alcohol. It is a brown stone Gothic structure, with heavy buttresses and a square tower. In the stained glass windows various saints are represented. The high altar in the sanctuary is surmounted by a large crucifix and contains figures of the Madonna and St. John. A letter to the editor of the Newark Daily Advertiser February 11, 1853 from Father Moran on the Madiai Controversy. NOTE: Microfilm originals at the church.